You’ll believe ghosts exist after seeing our photorealistic templates in action. How do we do it? Well, that’s a trade secret, but we can tell you that the process is tedious, time consuming and therefore absolutely worth it to make sure our blank t-shirt templates are the best in the biz. The reviews are in and this year’s lineup blank ghosted women’s clothing templates is impressive. We can’t wait for you to try them out! Below you will find our women’s t-shirt templates, singlet templates, long sleeve t-shirt templates, polo shirt templates, snap back cap templates and more. Need a black t-shirt template or a white t-shirt template? No problem, the beauty of a clothing mockup template is that you can change the garment color to whatever color you require, you can even have different sleeve, hem and button colors. Facebook – Your Mock-Ups are amazing. I use them on a daily basis most weeks! Web Comment – Overall this is a fantastic product, an easy to use and very customizable template. There was a slight hiccup with the initial delivery, but customer support was quick to respond and took care of it with no hassle at all. Very happy with my purchase. Web Comment – I am so happy that I stumbled across your website. I think that your photo-realistic templates are amazing!!! Creating your very own t-shirt design or clothing brand might be an ongoing hobby or a complete leap of faith into the unknown! Whatever your motivation, it can be an expensive process, believe me. What if there was a way to prototype your clothing designs long before entering the manufacturing process? This is where our blank clothing templates shine! Now, creative people like you, can visually prototype your clothing designs and test your product’s market potential before involving a screen print or clothing manufacturer. Together, you and a high quality clothing template can mimic a printed garment allowing your clients, audience, market or boss to see exactly what the finished design is going to look like. Heck, our templates are so convincing, that people use the templates on their ecommerce websites rather than trying to photograph the real garment, saves on having to purchase a good camera and lighting setup! What is a Ghosted Template? A ‘Ghosted’ template is a step up from a traditional flat-lay template. Instead of ‘laying flat’, a ghosted template shows details such as shadowing and folds as if the garment is being worn by someone invisible, a ghost. The benefit of these templates allows the viewer to look inside the garment instead of just the outside. Our Women’s High Resolution Ghosted Templates are perfect for eCommerce stores, graphic design projects, design competition submissions and so much more. Easily paste your artwork right into the template and have a realistic garment mockup for your website or project in seconds. 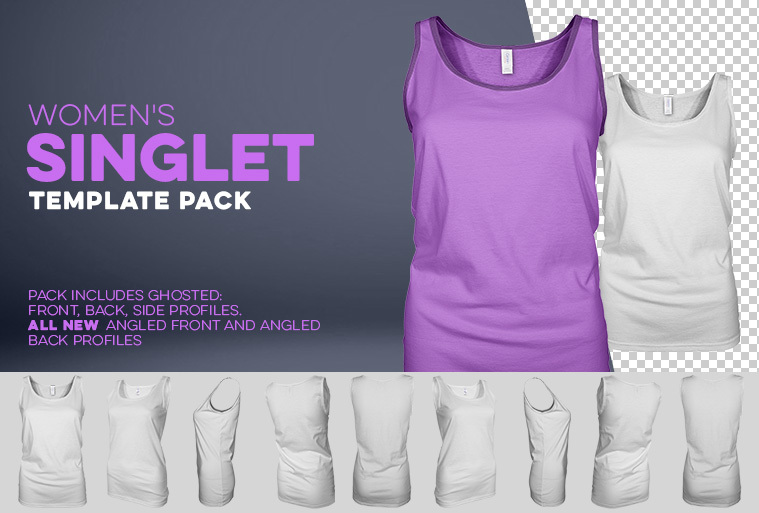 This women’s blank t-shirt template pack contains a full set of ghosted, customizable, fully photo realistic, layered photoshop files. 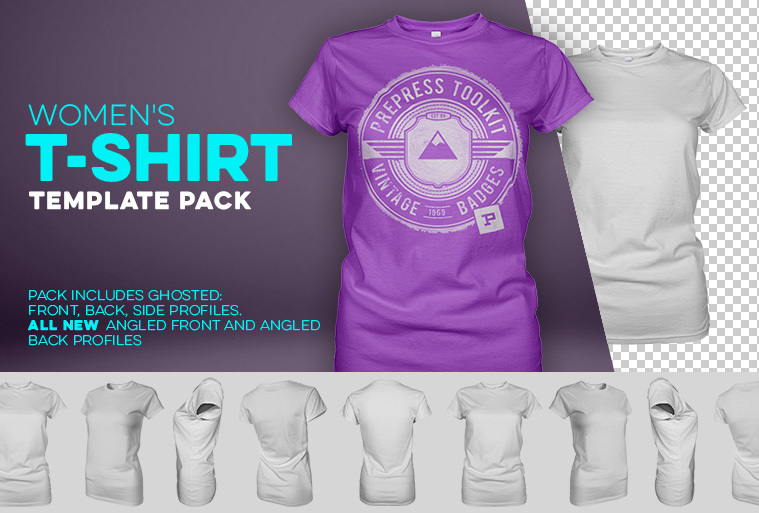 The women’s t-shirt pack comes with front, back and side profiles as well as the all new angled front and angled back profiles. 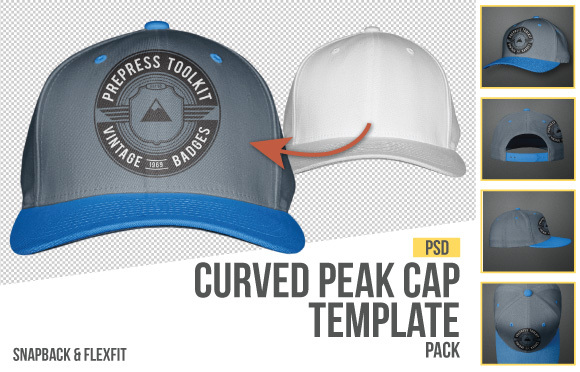 PrePress Toolkit is proud to be the first to offer a fully editable, angled, mockup template. Through the use of Smart Objects layers, simply add your artwork and the template will do the hard work of setting your artwork onto the t-shirt. All files are compatible with Photoshop CS3 and newer versions including Photoshop CC. 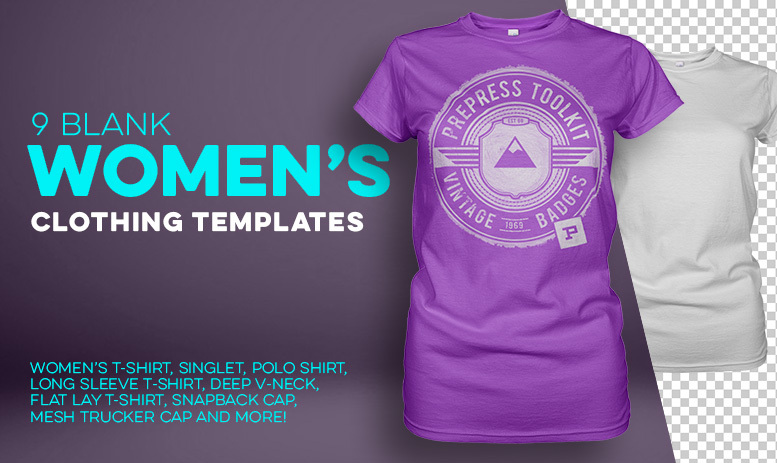 Download Women’s T-Shirt Template Here. 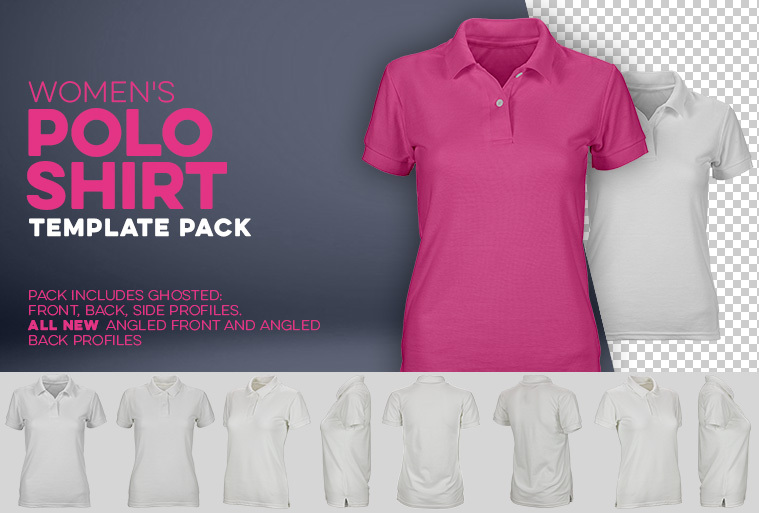 White, Black, Hot Pink… This women’s long sleeve t-shirt template mockup (like all our templates) lets you quickly and easily pick any fabric colour. The photoshop template is finely detailed and has the ability to hide the sizing tag if you want to print the sizing information directly onto the garment during production. A must have for your designers toolkit! 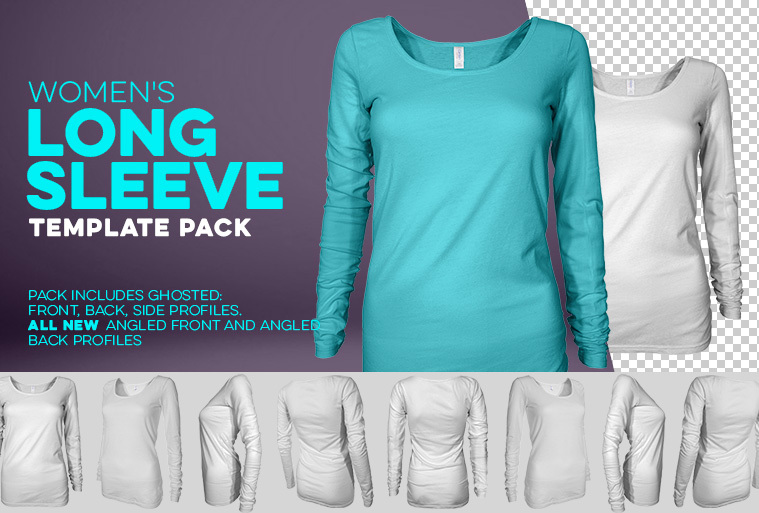 Download The Long Sleeve T-Shirt Template Here. You asked for it and we delivered. 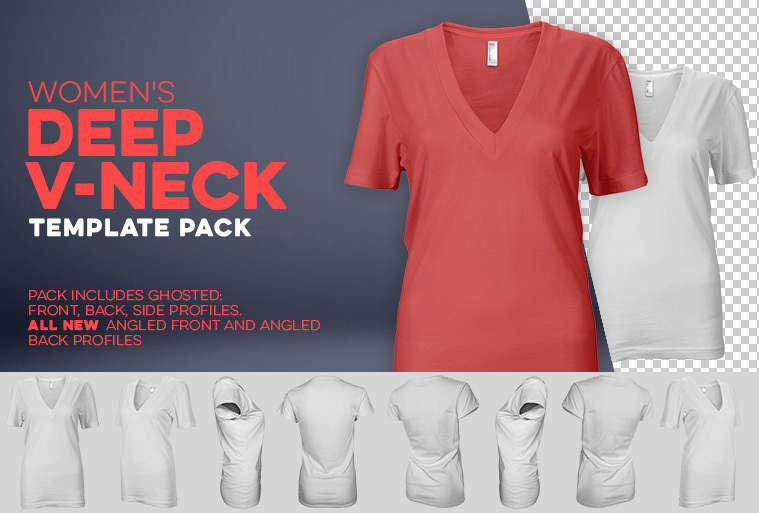 Welcome the new women’s v-neck and deep v-neck t-shirt templates. 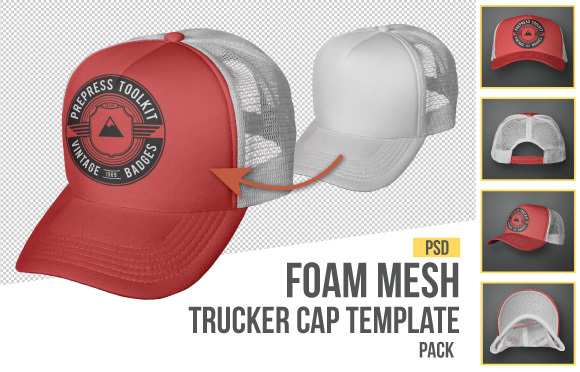 With our photorealistic template packs, creative people, like you, can visually prototype your merchandise design to share with your marketplace. This is a great way to test your product’s market potential as well as explore how it might look before going through the expensive manufacturing process. Download The Deep V-Neck T–Shirt Template Here. Our women’s singlet template (for Photoshop) has mega attitude and just screams “print something epic on me!”. As with all our template packs, you can choose any color you wish, show/hide the sizing tag and even color the sleeve and neck hems in a completely different color to the body. Multiple different profile angles included. Download the Womens Singlet Template here. Multiple front profile versions, consisting of unbuttoned, relax collar to button up, corporate look. Unlimited fabric color options, hide the visibility of the sizing tag and color the front buttons. Download The Polo Shirt Template Here. 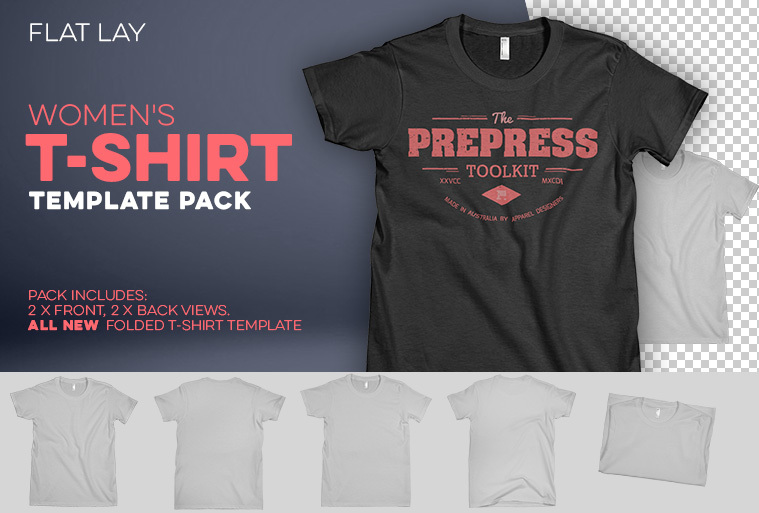 For a limited time only our new women’s flat lay t-shirt templates come as part of the Women’s Ghosted T-Shirt Templates Pack. What is a ‘Flat Lay’ Template? ‘Flat Lay’ means the original garment (in this case a women’s short sleeve t-shirt) was laid on a flat surface and photographed from above giving you a bird’s eye view. 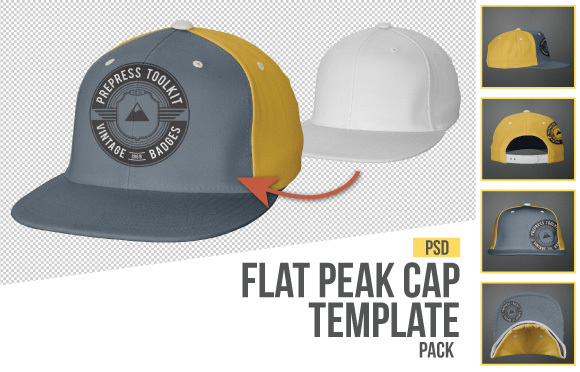 A great flat lay clothing template will be high resolution, enable you to easily add your artwork to a separate layer, then automatically apply texture and slight wrinkles to your artwork so the design follows the contours of the garment. A really clever clothing template, will give you options to quickly hide artwork that is falling off the template, give you options to show or hide the sizing tags, let you color the body, sleeves and neck hem independently from each other and work in Adobe Photoshop versions as far back as CS3! Yep…our templates do all that! Distortion filters mold your artwork to the curves of the fabric for a super realistic mock up. Files are layered and clearly labeled.